I really wish there was still some doubt on what Learning Standards or Competency actually mean or what they intend to alter. No one is openly admitting to us that in the future all that is desired are ‘existential competencies’, a ‘natural science worldview’, or a mind that can be easily read via Knewton adaptive software. We may find the aims sickening, but apparently the planning locations have been glorious. Can you believe our invite to the April 1-3, 2015 Global Education Futures-Forum California: Toward Learner-Centered Lifelong Learning never arrived? We could have stayed at the Five-Star Rosewood Sands Hill Luxury Hotel in Menlo Park and planned the future of learning globally while hanging out with tech titans there for the Global Technology Symposium. With rooms starting at $600 a night, we too could have lived the Jet Set Life while planning how to meet people’s ‘needs’. Since we were not invited and did not get to nestle our heads in high-thread count linens, who was there and how did this catch my eye? In early August ISSS-the International Systems Science Society-had its annual meeting in Berlin. Speaking on education were Alexander Laszlo, Ervin’s son and like him a former ISSS President, and a Pavel Luksha. Luksha is Russian but is involved with a project with MIT called Re-Engineering Futures. The California Forum was part of that work getting ready for a Kazan World Skills conference in May, the global World Skills conference in Brazil in early August, and then on to Singapore this fall. The final vision gets presented in Davos in January once again amidst the private jets, luxury linens, and foie gras This is all apparently how global plans can get marketed as local or even as something called the North Carolina Plan laid out in the comments with links on the previous post. http://www.edu2035.org/ is not a hot link because something is screwy with my computer this morning, but it is the site for the Global Education Futures Forum. What I am describing can be found there. Please pay special attention to the GEFF Advisory Board since it is linked to the Center for Curriculum Redesign because Charles Fadel is a listed member as is an Under Secretary of the OECD. Knewton has a representative which is why this week’s Wired article on the ability to read student’s minds is timely. Another listed member of the GEFF Advisory Board is Alexander Laszlo, who undoubtedly learned about collectivism’s need for a subjective mode of consciousness from his dad instead of the Grimm fairy tales most of us heard as children. Finally, we have former Gates Foundation exec Tom VanderArk listed, which means that the Brookhaven Innovation Charter just approved in Georgia (links in comments on previous post) that says it is based on VanderArk’s White Paper and the Hewlett Foundation push around Deeper Learning is tied to the GEFF vision. So are school districts like Fulton and other League of Innovative Schools districts that we have covered as bringing him in to consult and train. The entire state of Utah and the concept of Competency (just the means to stealthily impose that subjective mode) get implicated because next Tuesday and Wednesday, September 2 and 3, 2015 there is a Statewide Joint Conference there on Competency-Based education with VanderArk as the speaker on both days. Also speaking is Marc Tucker of the National Center on Education and the Economy so we also have the Common Core being shoved away as we get back to NCEE’s New Standards Project from the 90s, renamed now as Competency-Based Education. All of this fits perfectly with what my book Credentialed to Destroy foresaw. Chapter 4 on Competency is even more timely now than when it was written. One of the themes of the California Forum apart from the death of the Gutenberg Era and divvying up the billion dollar EdTech market was “How will educational ecosystems for emerging social practices be created?” Now I can scream all day long that the new forms of assessment are not in fact tests and are looking to create and monitor desired behaviors, but there is nothing like the concept of virtual reality prisons to make the point. This is from a GEFF 2014 report called Future Agendas for Global Education . In following up on all the intended uses of gamification and virtual reality in education of the future, the report mentions that “Besides that, gamification can be efficiently used to redesign the penitentiary system.” Now when we read the following quote, we need to appreciate that if these adaptive software and virtual reality worlds are powerful enough to remediate dysfunctional behavior, what is the effect of constant embedding over K-12 on normal minds? Now in a world where following the misleading phrase Career Ready Practices as the new purpose of K-12 leads us straight to a communitarian obligation to others and so does the now obligatory Positive School Climate, do we really think ‘dysfunctional behaviors’ will be cigarette smoking and eating disorders? No because the next paragraph states that “any gamified practice has an educational dimension, because the game clearly defines desirable and undesirable behaviors.” That is what makes it educational in this Brave New World that is no longer a work of fiction at all. Educational Dimension=altering human behaviors. No wonder the ESEA Rewrite the US Senate passed binds all states to use performance assessments to examine academic results. All behavioral too. Honestly I think the life of Five Star luxury being pursued to foist this education and Future Transformation vision must addle the brain at some level. How else to explain an insistence that “we now know too much” and that we need only “adequate science and technologies to be maintained and developed going forward.” No wonder we have repeated proclamations that the Gutenberg Era is over. It created the concept of the individual and liberated the human mind. Our wannabe political Overlords want to take all that away and the tech companies want to sell public officials the means to do just that. What parent when they opt for a Charter School for their child that hypes 21st Century Learning or who wishes for vouchers to escape bad neighborhood schools understands that they are really tapping into a GEFF plan to “reorganize the institutions of cognition and knowledge management.”? Now given the sorts of facts I turn up and papers and confessional books through the decades I can appreciate why this collectivist vision needs Mind Arson and knowledge management. Repeat after me: We will NOT acquiesce. Please take the blinders OFF about what formative assessments and a Whole Child focus around digital learning really mean. Otherwise, these planners want to create a Neuroweb of manipulated collective consciousness that is reminiscent of what Star Trek called the Borg. When people in positions of power with access to taxpayer money at the global, national, state, and local levels write of a desire to transform K-12 education and the very concept of learning and wish to “create semantic Internet and supporting artificial intelligence solutions that will structure human knowledge, and scientific knowledge in particular,” we need to listen. Now we know why digital learning is so crucial to all these future models of education. It’s not a better way to teach math or reading or about making backpacks lighter. It’s about rewiring the brain for collectivist political purposes and it is a Bipartisan pursuit going on all over the globe. Thankfully we know about the agenda and the links into our local classrooms. Will accurate knowledge reach enough parents and taxpayers in time or will the manufactured hype surrounding the Common Core continue to obscure the actual story? Miss me? ECAA (Every Child Achieves Act of 2015) is the acronym for the latest update to federal K-12 legislation and it is scheduled to come to the Senate floor for debate any day now. Yesterday, as I was getting ready to start trumpeting the truth of the tsunami coming at us again, I read a quote from Georgia Senator Johnny Isakson, the Republican sponsor of last summer’s WIOA legislation that I am so horrified by, http://www.invisibleserfscollar.com/priority-economic-citizenship-for-some-officially-sanctioned-status-as-prey-for-most-of-us/ . Politico quoted him as hoping for votes from ‘conservatives’ on ECAA because of the provisions allowing parents to Opt Out of testing requirements and also not requiring states to use the Common Core. Having read all 792 pages of that leviathan piece of legislation, a suggestion implying that those voting on it need only look at one or two provisions seemed to me like an excuse to ignore the reality of what the legislation shifts. Now I have mentioned in previous posts that the practices mandated and theories used track back to Soviet psych research and their 1930s views of the type of citizens they wanted education to create. That’s troubling, but lets leave the S word and its close cousin the M word (as in Uncle Karl) out of today’s concerns. Isakson’s points reminded me that there was language in ECAA that appears to override that Opt Out language since the required ECAA annual assessments are to be “administered to all public elementary school and secondary school students in the state.” I am pretty sure that will be the provision waved in parents faces after the legislation is adopted. Plus the school district can fight parents with litigation expenses funded by the taxpayers. No warm and fuzzy comfort from that page 617 prohibition against federal mandates, direction, and control. That target never varies and looking to make sure those desired Concepts are taking hold and are likely to prompt and guide future actions is PRECISELY what the ECAA required annual HOTS (Higher Order Thinking Skills) assessments that cannot be opted out of are looking for. Now we have come across other names for this focus on Concepts before and I have tagged some of them to this post. Showing just how crucial getting into and manipulating how each student’s mind works and how they are likely to behave in the future is to the global vision of K-12 education ‘reform’ that ECAA is a component of, the Next Generation Science Standards last month, in a draft of its “Primary Evaluation of Essential Criteria for Alignment” in the classroom assessments, created three new acronyms for us. SEPs–Science and Engineering Practices to make sure the concepts are tied to ongoing actual student activities and behaviors and are not just the subject of a dreaded test of knowledge, or, Horrors!, Rote Learning. We also have DCIs, which can be used in any area and stand for Disciplinary Core Ideas. Then we also have our last new acronym–CCCs or Cross-Cutting Concepts to provoke some genuine interdisciplinary insights and perceptions that apply across all subject areas. Cool, huh? Just think of what Joe Stalin or Fidel Castro could have done with an education system that pushes everyone to have the same perceptual filters embedded unconsciously within the mind and integrated into practiced behaviors until they are reflexes. Cannot linger because something else came out this past week–the Remake Learning Playbook that is expanding beyond Pittsburgh and working with the White House and Congressional initiative–Digital Promise and getting funding from the MacArthur Foundation. There is so much of the vision of where we are actually going in that Playbook, but relevant to today’s post in particular, was a mention of adhering to the Economic and Sector strategies created by a Harvard Business School prof by the name of Michael Porter. That got my attention since WIOA is full of Sector Strategies and the National Governors Association has cited it as a reason for needing the Common Core to reform the nature of American high school. (August 4 & 10, 2014 posts). So that name Michael Porter rang a bell from some connections at Harvard from witnesses Lamar Alexander called to testify at the original hearings on the reauthorization. Ignoring his connection to the Monitor Consulting Group bankruptcy since that should have no bearing on the validity of public policy recommendations, I discover http://www.hbs.edu/faculty/Publication%20Files/Clusters_and_Economic_Policy_White_Paper_8e844243-aa23-449d-a7c1-5ef76c74236f.pdf that Clusters are to be the new form of approved American Industrial Policy. As a bonus it allows the federal government and its agencies to coordinate with states and localities, which sounds a great deal like progressive polyphonic federalism (Jan 28, 2015 post) to me. Also goes well again with WIOA and those soon to be filed required state plans. Truly, my bliss at the public sector exploitation potentials knows no bounds. See why they need K-12 policy to line up with these planned manipulations? Now just imagine the potential for all the plans for metro areas to be the economic drivers and to force Equity in Outcomes from having Professor Porter be the founder of ICIC-the Initiative for a Competitive Inner City. ICIC, by the way, works with the same Brookings that is in charge of the Rockefeller-funded Metropolitanism initiative and the UNESCO/OECD Learning Metrics Task Force. If I had a white board and we were talking in person all these connections would seem to be a game of Whack-a-Mole, but apparently we are the ones about to get whacked. Now, not to pat myself on the back or anything, but after a book and 3 years of this blog, I really know this area so reading a 1960 book yesterday by a Harvard philosophy prof, Israel Scheffler, brought there in 1952 by the Rockefeller Foundation, I recognized that he, too, was describing the kind of behavior guided by conceptual understanding that has given us the above three new acronyms. Well, a few searches later of people who ought to be involved if my suspicions were correct pulled up a “Teaching for Understanding” initiative from Harvard in the early 90s that was originally funded by the Spencer Foundation, but later by MacArthur. http://www.exploratorium.edu/ifi/resources/workshops/teachingforunderstanding.html That would be the same MacArthur Foundation now funding the national expansion via the Remake Learning Playbook mentioned above. That paper explains all about ‘understanding performances’ and how true understanding needs to be demonstrated by behavior and action. Just like what we now know is required under ECAA’s definition of HOTS and what will qualify as the requisite Challenging State Academic Standards. Fascinating, huh? Remember all the references in ECAA to ‘needs’ and ‘personalized learning’? Well, the Playbook talks about that as well and recommends Project-Based Learning and the Maker Movement. How active! Maybe get to practice with all three new acronyms some more and join the “global conversation about learning innovation” while staying “responsive to the real needs and priorities of local communities.” Global and local-what a nice slogan. Probably why the various UN entities keep hyping it. I will get back to that Playbook in the next post since this one is devoted to all the initiatives ECAA pulls in that we were not supposed to know about. Some of us already know that the White House and various companies have really been hyping the Maker Movement and maker Faires. It’s not just that Playbook. Hint: it also dovetails nicely with Sector Strategy plans for us. When I was updating that Teaching for Understanding work by Harvard’s Project Zero, it pulled up a January 2015 White Paper from them called “Maker-Centered Learning and the Development of Self: Preliminary Findings of the Agency By Design Project” that builds on this desire to redesign our students from the inside-out and then let them practice until the shifts take hold at a neurological level. I’m afraid that is where the title came from. No boundaries anymore to what the White House, Congress, ed researchers, tax-free ‘philanthropies’ and others apparently plan to do to our students unless we are supposed to be cheered that no one is trying to get authority for sexual exploitation. They want to interfere with, redesign, and then monitor annually each student with mounds of data at the very level of the Self-their Identity. Mercy me. I think Mao Tse-Tung himself would have lusted after such authority over China’s citizens. Especially if hardly anyone would know of the level of interference and manipulation. Stalin and the Soviets made no bones about their intention to “bring all possible facilities of society to bear on the problem of training and controlling its individual citizens.” They were especially fond of using the law in such a binding manner. Methinks they would have liked the language of ECAA and its close sibling, the Workforce Innovation and Opportunities Act (WIOA) from last summer, a great deal. What these measures share in common is a desire to create an organized society. Now obviously that was not news to any Soviet in the 1930s, but it is news to many Americans in the 21st Century, which is why so much of what is intended to bind and quietly alter the minds of men is hidden and not being discussed openly. What is an organized society anyway? It’s the idea that a society can be consciously organized and directed. In the case of the US in the 21st century, the organization is around the concept of Equity and an obligation to meet people’s needs, whoever they are and however they came to the US. In pushing this vision of social justice, or as UN Secretary General Ban Ki-Moon calls it–Dignity for All by 2030–the organized society shifts from a place where people make their own choices to a “society in which–insofar as possible–all the parts are coordinated to the service of the whole by the deliberate decisions of persons who are in a position to implement that decision.” Hard to get politicians or public sector employees at any level to back off that kind of decision-making power once they get a whiff of the possibilities. Words to remember as we delve into personalized learning and so many of the practices and theories we have imported from the Soviet Union. What Bruner knew and what Carnegie knows since it funded the research, we are dealing with a comparable vision of using psychology to mold a consciousness and personality that becomes an activist in remaking the world that exists. Would you like to hazard a guess at the number 1 aspect or trait the Soviets knew they needed to control and mold? Motivation. Would anyone like to hazard a guess as to what the number one feature of ‘personalizing learning’ is in 2015 in the US? That’s right. It’s determining and then accessing student’s at the level of their intrinsic motivation. Manage behavior? Goal-seeking, purposeful actor? Doesn’t this sound precisely like the 30s Soviet shift on how to get at the minds of men to mold a new mentality? Should we be concerned that this 2015 National Initiative says that “From our perspective, the aim of personalizing learning is to enhance stable, positive, intrinsic attitudes that mobilize and maintain engagement in learning.” So all the language about “(a) ensure motivational readiness, (b) enhance motivation during learning, and (c) increase intrinsic motivation as an outcome” seems a bit heavy-handed, but it’s only one document, right? Well, there’s also the ISTE 2014 “Personalized Learning: A Guide for Engaging Students with Technology” that will likely guide what the language of ECAA really means for our students and ultimately all of us. It helpfully lets us know that “personalized learning is not the digitization of traditional learning” since after all, it is the student’s mind and personality that are the real focus of this digital menu. Showing that unfortunately subject content areas are merely the means to get the desired changes in the students we are told to set goals and then try to achieve those established goals. How purposive! A goal-seeking actor just like Stalin wanted the emphasis to be on. “Progress through subject area content is measured by the demonstration of proficiency in identified skills and understanding.” Those would be the skills and understanding needed not for the world we now have, but that desired future which needs a new kind of citizen and worker. Now I can say repeatedly that this is not the model of coursework we are all used to and insist how much manipulation is going on, but a vision of “courses built around concepts and learning outcomes” just speaks volumes about how socially engineered this “self-directed learning” will actually be. Let’s look somewhere else since this 2014 Summit on Personalized Learning of the White House-sponsored Digital Promise and League of Innovative Schools was uploaded to the internet about the time this new version of ECAA–1177–became available. http://www.fi.ncsu.edu/wp-content/uploads/2014/02/TEPLS_report-FINAL-051415.pdf Let’s go to page 18 since it is describing a federal grant to “revolutionize instruction”. Now how ‘personalized’ does learning in the ordinary dictionary meaning of the term seem if we specify what all students need to know and then want to assess “How will we know they’ve learned it? and “What will we do if they haven’t learned it?” How a student chooses to show their learning is flexible and the activities they engage in to practice the desired learning has lots of options, but what is to be learned does not. Whether the student gets it or not, there’s actually a great deal mandatory to this personalized vision. That’s just not supposed to be apparent to either the students or us, lest we object to the clear coercion at the levels of mind, values, attitudes, and feeling. This was true in every recent personalized learning paper I found. Here’s another http://www.siia.net/Portals/0/pdf/Education/PerLearnPaper.pdf The quiet mandatory nature makes perfect sense if this is all intended to be a molding mechanism in pursuit of an organized society where Equity is the lode star for decision-making. If we go back to that 1952 book it will tell us that “The Bolshevik controls man by training his motives and shaping his ideology.” As someone who has read all these reports and ECAA, I am now asserting that personalizing instruction and “personalized rigorous learning experiences” are intended to train student’s motives for future action as well. And the requirements about annual assessing of “higher order thinking and understanding” are monitoring whether the minds are being suitably molded and trained in “ideological thinking.” Because at its core, that’s where there is no flexibility. Is the student using the desired concepts? Is she demonstrating desired values and appropriate attitudes? Will he be motivated to act when and in the way desired? At least Uncle Joe was transparent in his aims, unlike Congress and most legislatures, governors, and city councils. Eager to benefit from such social and political control over us. Now if I had described that “learning activity” before Christmas and linked it to the Arational Mind push we have been noticing going back to this post http://www.invisibleserfscollar.com/blending-sustainability-and-education-to-gain-arational-nonlinear-minds-and-new-behaviors/ , I would have had the makings of a good freestanding post. Knowing the goals of the global CIFAL Network, the desire to use ICT to extinguish the Left Hemisphere’s historic dominance per that Global Village book, plus the explicit goals transformational goals laid out by ValuesQuest and the Institute for the Future, and the new vision of the role of the law globally, just make it so much easier to grasp why fact-filled, analytical minds would be regarded as barriers to all that planning and collective transitioning. What would such instruction, maybe called ‘personalized learning,’ look like? How about the Mindshift confession that “When it comes to assessment, many games have robust back ends that provide assessment data about the students who play them. That data can be extremely useful, providing information about your students that is applicable well beyond the game itself.” Information the students themselves may very well not be aware of. Data that adaptive learning ICT platforms need if they are to have the desired effects of changing the child’s perceptions, values, beliefs, and attitudes as the new focus of student-centered K-12 education. “Keep in mind: The common attribute of all effective learning games is that they simulate systems [or real-world social structures the trasfomationalists want students to believe are systems comparable to how the heart and lungs reliably interact]. They teach students how to understand academic concepts in relationship to the world around them. Certainly this increases engagement [what Ornstein called Being in the Moment that he tracked to ancient Asian religious practices] and retention, but what really matters is about using knowledge in interdisciplinary ways. [Don’t feel under control just because your personal use of knowledge is being prescribed in advance]. Interestingly enough, precisely what Ornstein said a Right-Brain oriented curriculum should be doing if it intends to shift the focus from intellectual content to personal knowledge. Oh, our joy at effective school reforms that will raise student achievement in meaningful, authentic ways knows no bounds. Why did I start this post’s title with Bogus Excuses? Well, should we buy that games-based learning is OK for the classroom because “a generation of gamers has grown up without a civilization collapsing”? Someone was not listening when their English teacher covered the dangers of hyperbole. How about this rationale? “Positive mood states” or empathy “toward people from another country.” I am also afraid that being told “the way corporations, foundations, and research organizations are thinking about games and learning” is no justification when they are all on record seeking transformational social change using K-12 education. If you want a transformed economy, then push education based on “connected, networked ways of knowing that will dominate the digital future. Sharing and collaboration go hand-in-hand with integrating non-competitive and non-commodified ways of playing games.” Will that lead to a shareable economy? Maybe but it will be necessary since so few graduates in such a vision will have the mind or skills that have always been necessary for wealth to arise outside of war and just taking. Is it true that “The way students play and learn today is the way they will work tomorrow”? Maybe, but they will be quite poor in such a world unless they can get elected or appointed to office or get a tax-free job in the UN System. Mostly the gaming is prepping for the student to be a participating member of a planned and controlled system, blindly accepting from a deep emotional level that increasing levels of material deprivation are inevitable and not a result of predation by the public sector. Instead of declaring war on another country for wealth this is a system of predation on citizens. For those of us with a base of history knowledge not grounded in role play, it’s what the nobility did when they imposed serfdom. People exist for the use and benefit of those with power and are not free to make their own choices. No thanks. Another bogus excuse is that “the distinction between STEM and ELA is an arbitrary and superficial one” since they are each “simply forms of expression.” That really is someone determined to extinguish the analytical, rational mind for reasons laid out in Chapters 2 and 3 of my book. “All good games offer challenges in intuitive ways.” Want to guess which side of the brain acts intuitively and which does not? Another bogus excuse? Gaming needs to be a part of early childhood education because it “teaches those students to associate screens with refined cognitive skills.” In other words, those children are to never know what rational, non-designed, grounded in facts, spinning out of various scenarios and likely consequences actually feels like. And won’t that be helpful to all our self-confessed transformationalists and futurists? So they and others can build a new kind of economy and society together. Never appreciating in time that none of these things actually are ‘systems’ ready to fall into place like a game. Now I have written about the new federal legislation WIOA and its impact on all states and regions to plan their economies going forward. I have also explained admissions that the Common Core is really just a ruse to jettison the traditional role of high school and force the School to Work vision that was so controversial in the 90s. I have explained all the federal programs on integrating CTE into academics and forcing industry sector strategies and Career Pathways. None of those undisputed legal obligations that would be hugely controversial if they were being openly admitted is mentioned at all in the Chamber of Commerce’s vision. All the public-private partnerships that have been stealthily imposed as legal mandates are omitted so that when those partnerships either come into being or step out of the shadows over the next few months, they can be described deceitfully as a private initiative taken by employers to fix their skills gap. Now doubling really isn’t enough to describe all the deceit going on, but I do like alliteration. Neither we or our children deserve to be treated as akin to things in an inapt Supply Chain Management metaphor for political power enacting a “workforce strategy for our time.” If I spend all this post just describing that document, the level of deceit and coordination will not be revealed. I do want to link to this story on each US state’s federally coerced longitudinal workforce data system http://abcsofdumbdown.blogspot.com/2014/12/the-greatest-christmas-present-to.html?m=1 and point out that this is precisely the expanded data sharing called for on page 28. If you are wondering how the last post on Character Education fits in beyond the collectivist molding aspirations, let me introduce this 21st Century Workforce post from Charles Fadel of the Curriculum Redesign Project http://www.huffingtonpost.com/charles-fadel/skilled-for-success-raisi_b_787394.html created back when he was better known for being the architect of the 21st Century Skills framework (the one with the rainbow if you are unfamiliar with that P21 Global Graphic. Here’s the presentation he gave in 2012 to the Workforce Readiness Barometer Meeting http://www.slideshare.net/CurriculumRedesign/tcb-assessments-charles-fadel Fadel, you see, globetrots selling the vision of “21st Century Knowledge, Skills, Character, Dispositions” blending workforce readiness, a skills focus, changing personality traits, touting mindfulness, and gutting subject-content as the purpose of K-12 education. The book ends with a diagram called the Big E Glocal Problems. Education at noon on the circle, Equity at 2 o’clock, Environment at 5, Energy at 7, and Economy at 10. Global problems that students can get involved in locally in their communities. When the diagram creates a star among all those points, in the middle is Quality of Life as the need for societies now to push the UN and the OECD’s visions for Subjective Well-Being and Gross National Happiness not tied to economic growth. Yes, that is also known as Marx’s Human Development end-stage model. Not a huge shock since the OECD, UNESCO, and the World Bank (remember its mental models recent confession?) are all named partners of Fadel’s in that CCR. The book also stated that Fadel and P21 area are advising the Asia-Pacific Economic Cooperative (APEC) on this vision, which explains why we keep running into it in countries without any Common Core. Australia, China, Canada, Russia among others are listed. Fadel and Trilling also write about developing a communications strategy to sell this vision. Precisely what hyping the need to “Close a skills gap so that America can be internationally competitive” deceitfully does. I have pointed out before that CCR has lots of tech company partners, but one of Fadel’s slides mentioned a company called Sematech. I looked it up and it’s a tech research colluding consortium http://www.technologyreview.com/news/424786/lessons-from-sematech/ touted as the “model for how industry and government can work together to restore manufacturing industries–or help start new ones.” Corporatism is the polite term for this arrangement, but it has others. Needless to say it all fits in with the Chamber’s vision of public-private partnerships among governments at all levels, colleges and universities, and Big Business and collaboratives of small and medium-sized companies. Anyone remember the 1976 Turchenko vision from my book? We’re Here! One of the co-authors of that Chamber Report is tied to the creation of labor market credentialing and thus Qualifications Frameworks in the US just as I predicted in my book. www.ansi.org/news_publications/news_story.aspx?menuid=7&articleid=de4e4462-95f0-4bf2-ab7a-a545f8a8270d Yet another controversy no one is owning up to. Another is tied to this consulting group that went bankrupt. http://www.bostonglobe.com/opinion/2013/01/20/when-smartest-guys-room-bankrupt/lUYj7Nl8vAHhlL1iWVpSoK/story.html We can understand how a planned economy benefitting the politically connected would seem far less messy. The third https://www.mapi.net/blog/2014/07/qa-jason-tyszko ties it to the Manufacturing Alliance’s vision of STEM Pathways developed in Illinois. Because that sounds so much better than the reality of vassals and fiefdoms and what Benito called Fascism. I have given lots of cites here because we are talking about grave matters and we deserve to recognize there is no dispute over what is being tried. But no one involved wanted this full vision to come out. This is a vision of the future that can only last as long as the Federal Reserve can still print money magically or the US can borrow it. None of the people involved at any level have an incentive to put all these pieces together or imagine the real consequences of the vision. As usual, we ordinary people and taxpayers have no choice but to take a hard look at this reality. That’s the only way to start the vehement protests in time and know what to do to best protect our loved ones in the meantime. Speaking of that, I hope all my readers are enjoying this special time of year. It’s about time for me to shift fully into Chief Elf and Cookie Maker Mode. I always feel odd writing down that infamous name, but as I learned when I was researching my book, Uncle Karl is never very far away from the theories behind the actual classroom implementation. Sometimes the link is too direct and too huge in its implications for me to use a cute euphemism either. Especially when Marx is cited directly as the support that leads to all the current hyping of Neuroscience and Brain-based instruction. How direct? Well, Etienne Wenger from our last post wrote a book Communities of Practice: Learning, Meaning, and Identity that I found deeply troubling. Diving into the relevant footnotes pulled up a book I had never heard of that turned out to be $800 used on Amazon when I looked. Not wanting to eat PB& J sandwiches for the next 6 months to secure a copy of The Concept of Activity in Soviet Psychology, I decided to go internet surfing to see what cited Soviet psychologist AN Leontiev actually wrote about “The problem of activity in psychology.” In case you haven’t noticed, the requirement of active learning and a shift away from print, lectures, and textbooks is what I would call omnipresent in the real Common Core implementation. Knowing how crucial learning tasks are I thought I would gain some more useful insights. What I was not anticipating was for Leontiev to lay out aims and practices I recognized from all my research and then cite repeatedly to pages from Marx and Engels or from some of Marx’s other works. Waiting until the next book could be published simply will not do. Just last week, independent of this research, someone asked me if I was familiar with the White House’s new Fattah Neuoroscience Initiative. The answer was no, but it did not take much insight to guess that it would be linked to John Holdren, which turned out to be quite correct. http://docs.house.gov/meetings/AP/AP19/20140227/101775/HHRG-113-AP19-Wstate-HoldrenJ-20140227.PDF is some recent testimony from him on all that federal activity involving the physical structure of the human brain. Notice though that Holdren leaves out that Digital Promise and the League of Innovative Schools also report to him and they happen to be carrying out precisely the kind of education activity that Leontiev wrote about. Holdren also leaves out his long time ties to Paul Ehrlich and his stated desire for Newmindedness no longer grounded in a logical, rational mind. Just think of the implications of all this Neuroscience and Grit, Perseverence research for Ehrlich’s current global research project–MAHB–the Millennium Assessment of Human Behavior. Now that I have reminded everyone of the real current links to where K-12 in the US and globally is going, let me add one more thing. I found this graphic Leontiev book on servers at the Laboratory for Comparative Human Cognition at UC-San Diego. The place where Michael Cole and Yrjo Engestrom [see tags] have created the global base for Cultural Historical Activity Theory in the years since the Berlin Wall fell. Happy 25th anniversary for that Happy Event by the way. Let’s commemorate that Death of Tyranny by continuing to expose that so much of the ideology we thought we were leaving behind in 1989 came on into the West invisibly through a new kind of psychology and a new vision for K-12 education. To bury such destructive required collectivism once and for all we have to know it is there. 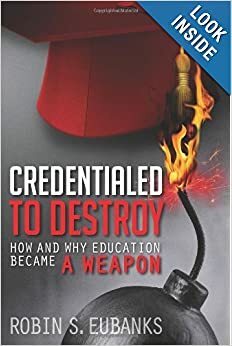 If you have not yet read my book Credentialed to Destroy: How and Why Education Became a Weapon, get it. What happens when doing all that as a physical, sensory activity involving group participation becomes the very assessment of student ‘achievement’ or Growth? What happens when the purpose of digital learning is to access a student’s internal “picture of the world” so that learning tasks, virtual reality gaming, and adaptive software can provide virtual and physical experiences to alter that picture in desired ways? Ways that are chosen by others for their intended effects on the student at a physical level. What happens when, having cited to Marx and Engels on the effect of vocabulary and words generally on consciousness and perception, educators then do everything they can to limit vocabulary, manipulate the words and concepts that are supplied, and minimize the historic role of print on the mind? What if K-12 education seeks to circumscribe human thought in the 21st century so that it is “nothing else but a derivative of practical activity”? With the stated goal being a “true solution to this problem of the origin and essence of human thought.” And why is human thought problematic? Because independent rational human thought with access to a store of facts does not submit to Overlordship easily. All these required practices hiding now as pedagogy and Effective Teaching are all actually about subjugation of the mind. And personality too. Leontiev’s Chapter 5 has with a lead-in header of “Personality as a Subject of Psychological Investigation.” How’s that for aspirational? Do free societies do that nonconsensually using deceit? That analysis, by the way, has to get to the relationship of “motives and needs” just like innovative education seeks to do. Lost no more and just in time. Historian Richard Pipes in the book mentioned in the two previous posts pointed out that even animals show repeatedly that acquisitivesness is innate. Trying to dislodge what is innate via K-12 Whole Child education premised on practical activity and social participation is simply not going to end well. Now would be a great time to start recognizing the ancestry of all these required changes in the nature of education. No more euphemisms. Not with the stakes this high or the aims so personally intrusive. If the last two posts have made anyone feel like they are on a roller coaster with a sickening feeling in the pit of their stomach, I am genuinely petrified about all the references to using K-12 education to try to physiologically redesign the brain. The OECD really did state in a report issued just this week on Metacognition that ‘we’ need to “control cognition”. We cannot ask anyone if their meddling knows no bounds if we are not aware of what is being targeted or why. I was detailed on this in my book. What has shifted since I wrote it is how often images of the physical brain are showing up in Learning Presentations to administrators. http://www.lbusd.k12.ca.us/Main_Offices/High_Schools/Linked_Learning/videos.cfm gives a High School PLC Institute example on the new 3 Rs–Rigor/Relevance Framework. Someone who runs a hugely followed Internet site on the Common Core said to me in person at a hearing and then via email that the psychological emphasis of my work scared her so she would make no effort to let her readers know what was in the offing. A lapel pin with an Apple Core with a Red Line through it shows valid concern, but it will do nothing to protect the children from this actual psychological focus. http://www.oecd.org/edu/ceri/IS%20Project_Conference%20Brochure_FINAL.pdf states that the OECD (remember DeSeCo from the book and the transformations outlined in the conclusion?) has a new project to “further develop and refine a framework and prototype formative assessment tool for 21st century skills.” Do you live in a district where the children will be used as guinea pigs to develop those “Behavioral and social skills (character)” and “Skills in thinking and creativity” that are conducive to the OECD’s idea of innovation? That would be entirely new institutions, a transformed ‘grassroots’ society centered on subjective wellbeing, and a sharing economy centered on cities and laid out here. http://newclimateeconomy.report/ That’s the actual vision attached now to being “internationally competitive” when we follow the facts. Today I want to take us (maybe want is not the right word). Let me rephrase. Today we are going to look at what the KnowledgeWorks Foundation calls “Recombinant Education” and its partner, the Institute for the Future, that brags about having developed the manipulative Delphi Technique, calls Future Work Skills 2020. The latter report by the way http://www.iftf.org/uploads/media/SR-1382A_UPRI_future_work_skills_sm.pdf was created with the University of Phoenix in case anyone wants to believe these shocking statements will not influence degrees and online programs. When someone of Richard Pipes’ eminence follows up that quote with an observation that “Hitler held the same view of rights, including property rights”, please do not retort anything about Godwin’s Law. It’s a warning pertinent to where this is all going as we encounter those 15 Constructs from the last past and formative assessments to make sure individuals are ‘guided’ by the desired concepts in how they interpret their daily experiences. That WorkSkills report even mentioned the Key Skill of Transdisciplinarity as needed for the Future Workforce. Precisely what those 15 Constructs from the last post said they were creating from the inside-out. The Future Workforce report assumed that “immersive and visually stimulating presentations of information [will] become the norm.” That will replace print for most people, which will mean the loss of the one thing known to create the rational, logical, independent mind. It is certainly ironic that John Holdren’s Digital Promise federal initiative is being used to bring about the precise Arational Newmindedness Paul Ehrlich longed for back in the late 80s. http://www.invisibleserfscollar.com/blending-sustainability-and-education-to-gain-arational-nonlinear-minds-and-new-behaviors/ Give the long time colleague a Gold Star for effort! IFTF insists that we can “plan our environments so that they are conducive to the outcomes that we are most interested in.” That is known as a sociological wish, not a fact, that has a notorious past. Nevertheless, we get to hear about neurogenesis research (the creation of new neurons), where it is hoped that “change the environment, change the brain, change the behavior.” All without any need to give notice or get consent from the individuals being targeted for a new “Design Mindset.” IFTF wants government policymakers to make “education a national priority” and “consider the full range of skills citizens will require.” No need to consult the individual citizens or respect their or their parents’ desire not to have a New Kind of Mind grounded in emotion and Arational. Resilience is one of the listed IFTF categories and it is designed to prevent individual or community responses that focus on “resisting disruption or maintaining the status quo.” In other words, whatever happens in the future K-12 education is trying to take the likely response out of the hands of individual citizens. They get instead “A New Civic Discourse–Rearticulating Identity and Community in a Global Society” that does not care one bit what the US Constitution established so long ago. Another category–“Pattern of Recognition–An Extremely Visible World demands New Sensemaking” discusses the impact of data a great deal and calls for fostering “collective sensemaking.” No wonder the need for classrooms to develop a shared understanding of everyone after Discourse keeps coming up when we look close. Remember the Rockefeller Funded Communication for Social Change? If that seems troubling, there’s a break-out later that admits that data will monitor a student’s “social and emotional conditions, to predict performance and suggest personalized strategies for success.” Still excited about Personalized Learning and what the League of Innovative Schools is pushing with its federal mandate? How about the admitted ability for “Reading Your Mind”? There’s no indication the student will actually be informed of the results of the ‘reading.’ How is a futurist or policymaker in education different from the typical Palm Reader or Clairvoyent could be the new question given these admitted aims with students. How will the inequities be addressed? Building up the learners who have not yet shown “what learners will need to know”? Or using Complex, Unknown, and Nonroutine Problem-solving to try to scramble the rational brains of the more able students? To try to force them to respond from emotion instead of logic and facts. And if you wonder why I keep remembering Uncle Karl’s vision for all this, let’s get a dime for every time we encounter a reference to meeting ‘needs’ in this vision of the future. Notice the reference under Shareable Cities to “open governance” and remember my warning over the e-Republic and e-Democracy. Time to pull more open nefarious declarations into the sunlight of public scrutiny. There is still time, but not if we continue to make this simply a Debate about the Common Core. It is So. Much. More. If our 21st Century Lives were just a televised game of Jeopardy, the title would be the answer that would be linked to the championship. The correct question would be: What are the real goals envisioned when Education Reformers, politicians, and Political Radicals use the misleading term ‘standards’ in K-12 education? When that transformative Global Partnership we met in the last post says in bold face type on page 8 that “the pursuit of deep learning goals enabled by new pedagogies and accelerated by technology” is a Moral Imperative that will “guide all of our work,” what goals are really intended? The first part of the title comes from a paper published in the 1999 ASCD Yearbook called “The Role of Standards in Educational Reform for the 21st Century.” We actually do not have to assume that there is a link since one of the co-authors, Peter Hill, is also listed as a participant in the new Global Partnership on page 2 as one of its educational consultants. http://www.carmelcrevola.com/publications/The_role_of_standards.pdf is the paper that once again makes it clear that the word standards is now being used as an Orwellian synonym. Translating the Common Core State Standards accurately then by its real purpose would be Common Behavioral and Dispositional Goals for All American Students, No Exceptions. Put together by DC-based trade groups hoping to cash in from the attached new vision of a politically-planned economy and society. Perhaps staffers who got to go on one of those trade junkets to China and thought that vision would work better for them. Hill made it clear on page one that the role of standards is to foster “values such as equality, fraternity, and democracy” indicating he may have always wanted to participate in the Storming of the Bastille. Best not to teach why such insistences can lead to a bloody Terror followed by a Napoleon. The latest book tied to the World Order Models Project, the 2008 The Global Commonwealth of Citizens: Toward Cosmopolitan Democracy by Daniele Archibugi, wants to make “prevailing world public opinion” the determinant of what governments ought to be doing on behalf of their people, the governed, in the 21st Century. That aim, of course, puts quite a premium on manipulating that opinion from the Cradle to the Grave, as the current political slogan goes. Or Womb to Tomb in another variation. Archibugi does want a radical transformation where by “virtue of the UN’s Universal Declaration of Human Rights and the subsequent pacts, individuals have been endowed with positive rights that they can claim from their own states,” preferably at the local level via those ever compliant mayors, City Councils, and appointed regional commissions who just love federal grants. Now we could make a good case that I contribute to the common good by reading books on all these plans of transformation and then tying them to what is coming to a school and classroom or your business place soon, but I believe Michael Fullan, Pearson, the OECD, and the Rockefeller and Gates Foundations want it to be their idea of appropriate values and the common good. Given all the references to ‘consensus,’ ‘shared purpose,’ and ‘collective will,’ there really does seem to be an organized attempt to erase any concept of individual sovereignty capable of standing supreme against the state. I guess that is what happens when you import your instructional practices from the Soviet Union, nurture the economic vision in a place that worshipped Mao, and look to rich universities full of wanna-be political and social planners for the vision of what “We the People” is supposed to mean in the 21st Century. It may also create students like what we are seeing in Denver, Colorado and what we saw during the heyday of the Occupy demonstrations who have no acquaintance with any factual knowledge from the past. Where will they be when OPM-Other People’s Money-inevitably runs out? Can they become self-sufficient as an adult or will change by force, rather than persuasion, feel like the justified response? Is there any place in history where deposing sovereignty from the individual and placing it in a collective under political control, actually ever diminished oppression? Guaranteed to ignite would be the reality. No wonder perception and student daily experiences are being so manipulated. Next time we will come back to the new view of politics in a Real Utopia and the Electronic Republic where we each get to be governed. The problem with censorship, apart from the loss of personal liberty not to have governments intervene in what we think and how we must act, is two-fold if you are a wanna-be Steerer of Human Keels in the 21st Century. Some information always gets through and everyone knows that their flow of information is being regulated and manipulated. By using K-12 education globally in the 21st Century to “control learning experiences” or creating behavioral goals for what students are to “think and do” and then euphemistically labelling those aims as “standards” or “outcomes,” our Steersmen get to create what I am going to call Censorship Before the Fact. They intend to rule and they get to control what most of us will pay attention to, or ignore, in our daily lives. Plus we will not try to resist what we do not even recognize is there. I want to go back to the 2014 book The Fourth Revolution that I first mentioned in the September 21 post (2 back). We can just imagine how joyful the veterans of these trade junkets to China are to have had the US Congress enact that Workforce Innovation and Opportunity Act in July now requiring all states and localities to create state and local economic development plans tied to education.http://www.invisibleserfscollar.com/priority-economic-citizenship-for-some-officially-sanctioned-status-as-prey-for-most-of-us/ I just want to point out that the Confucius Institutes mentioned are the same ones the College Board announced a formal alliance with this summer. Common Core Chief Architect David Coleman even made a very odd servile comment about “They are the Sun and we are the Moon.” The Boao Forum mentioned left Asia for the first time for a meeting and decided Seattle, Washington with Microsoft support and Bill Gates keynoting was a good place to meet. Bush Treasury Secretary Hank Paulson, who presided over the taxpayer bailout of political favorites during the financial meltdown in 2008, also is deeply involved with Boao. All of that is relevant to what is coming to the US, Canada, UK, and Australia, but those are connections no one is supposed to be making. Since I have the planned template and blueprints, I know where to look and what counts as connected that would be off most people’s radar screens. We know though from Michael Barber’s Oceans of Innovation report for Pearson covered here http://www.invisibleserfscollar.com/descending-to-a-connected-kleptocracy-via-the-digital-learning-and-climate-change-ruses/ that he, the US Department of Education, and Pearson all see China and a collectivist future as where K-12 education reforms are going globally. I am sure it is totally coincidental that the book was published by a Pearson entity and the authors write for a different Pearson entity–The Economist. Pearson, Microsoft, Intel, and a new entity headquartered in Washington State which has gathered actors from all over the world–Collaborative Impact–have developed a partnership designed to promote a new consistent vision for K-12 education globally. This lays out their vision http://www.newpedagogies.info/wp-content/uploads/2014/01/New_Pedagogies_for_Deep%20Learning_Whitepaper.pdf You may have noticed that today’s post is less about the how of K-12 ‘reforms’ and more about turning a spotlight on the mostly invisible end game. Before We are Bound and while the Necessary Keels are still being laid in the young people who are the voters of tomorrow. Participants in a Collective in other words. Ruled and Governed. Although Michael Barber is a key component of this partnership, the Lead Global Change Agent is Canadian Michael Fullan. In his 2001 book The New Meaning of Educational Change, Fullan cited personal communication to him from Barber, who was then heading up the equivalent large-scale reform in the UK for Tony Blair. Usefully for us, is the statement that for governments to be successful in the long term requires “creating frameworks for the accountability of public services including education.” Remember in our new “joined-up capitalism” we have private vendors but public regulation of what they do and how they do it. The mirage of free enterprise. Corporatist Enterprise as I have seen it called. Anyone surprised to learn that last week the Center for Reinventing Public Education and Fordham released those very accountability standards to go along with the Common Core? Adapt means change. Adapt means transform. Legally imposing this via K-12 education is the kind of Censorship Before the Fact that would be resisted if done visibly or to adults with Axemaker Minds. I want to stop here so next time we can tie everything we know is coming to our schools and classrooms to the latest vision (2008) to come out of WOMP apart from that Richard Falk essay cited in the previous post. It’s called cosmopolitan democracy and it ties to everything in this post and the previous ones on e-Governance and Deliberative Democracy grounded in Dialogue. It also fits with the Sharing Economy so many of our mayors and cities are signing on to. Since no one else is willing to admit that all these global K-12 education reforms are about “moving from the polis, founded on borders, to that of the cosmopolis, founded on sharing,” I will keep at it until Epiphanies Abound. I guess we have also found yet another reason why traditional American History is becoming forbidden. Did I mention the former Head of the Gates Foundation, Tom VanderArk, started pushing the Gates-funded/Russian-created Big History last week as well? Or as I like to call it, History Suitable for a Collectivist Future anywhere in the World.